It's time for another installment of this popular series. In no particular order, here are some thoughts on building a career in the fitness "biz." 1. Stay away from political discussion in a business context. I've briefly written about this in the past, but it warrants reiteration here with the election fast approaching. I'll give you an example. A good friend of mine in the fitness industry posted some pretty strong politic opinions on his personal page the other day. I won't mention which side of the fence he's on, but suffice it to say that it stirred the pot enough to warrant a somewhat contentious - but mild relative to the typical - political exchange in the comments section. As I type this, he's typed out 635 words between his initial post and the replies thereafter. In the process, I guarantee that he's persuaded absolutely nobody to change their mind, and he's irritated at least a few of his friends, clients, and potential clients. Moreover, had he dedicated those 635 words to an educational blog post, exercise tutorial, he'd have added value to the industry and, in the process, likely added to his clientele. It's easy to track how many clients you've gained, but it's impossible to quantify how many potential clients you've lost by putting your foot in your mouth. I don't talk about politics on social media because deadlifts and fastballs are a lot cooler. 2. Never underestimate the value of a hand-written note. Vin Scully is an absolute legend - arguably the most famous sports broadcaster in history - and I'm sure that notes like this were just some of many things that made him so well liked by all in the game of baseball. So, grab a pen and note card and fire off a few messages; it's a lot more productive than arguing about politics on social media! 3. Trainers need to think about retirement savings. a. A majority of Americans are not on track with their retirement savings. While I can't verify the exact numbers, I recently heard that only 59% of Baby Boomers have any retirement savings, and that only 10% of Americans as a whole are on track with their retirement savings. It's virtually certain that we won't get back all that we are paying in on the Social Security front. b. Outside of college and professional strength and conditioning positions, very few fitness professionals I know have 401(k) matching programs at their places of employment. And, very few of those who work for themselves are setting up simplified employee pensions (SEP IRAs). c. It's a lot harder for trainers to prolong a career and delay retirement because standing on gym floors for long hours into your late 60s and 70s really doesn't feel very good. Shorter careers + less structured retirement planning options = less-than-stellar retirement savings. To my fitness professional friends, even if it's just a few bucks a month, please, please, please start saving. If you understand the power of compound interest, you can skip one meal "out" each month to make it happen. (Note to my talking-politics-on-Facebook friend: this article just exceeded 635 words. See how much value I've delivered in about twenty minutes of typing?). In his recent release, Invisible Influence, Jonah Berger writes, "The more people see something, the more they like it. Familiarity leads to liking." To some degree, this is a spin on the law of repeated exposures. Folks may need to see your marketing message many times before they realize that your product/service is the right fit for them. However, I think that the most valuable marketing message is in-person interactions. Looking back, I'm convinced that the single-most important contributor to our success in our early days was how much I got out to watch high school baseball games (which I really enjoy doing anyway). In doing so, I a) supported the players, b) saw up-close what we needed to work on, and c) met parents. Remember that people aren't just buying the product or service you're selling; they're buying you and buying into your corporate culture. Especially with training young athletes, parents want to know they're putting their kids in an unconditionally supportive environment - much like they do when they seek out a day care for their toddlers. To the parents out there, have you ever noticed how most people have no problem leaving their kids with grandparents, aunts/uncles, and older siblings, yet every potential babysitter has to go through a thorough "vetting" process? The babysitter isn't familiar; family is. 5. Be really good at some things, good enough at other things, and always know enough to refer out. Wil Fleming is a good friend of mine and very accomplished Olympic lifter. He also runs a successful sports performance facility in Indiana. Over the years, Wil has actually referred a few of his most accomplished baseball athletes to Cressey Sports Performance because he felt that our specialization could help take them to the next level. Likewise, I'm heavily focused on the baseball population, but would be ill-equipped to support a competitive Olympic lifter who is trying to compete at a high level. Sure, we can coach up technique in beginners and the everyday athletes we train, but a guy like Wil is far more equipped to work with someone who is making a career of Olympic lifting. I've referred several of these kind of athletes out over the years. It's important to have a baseline knowledge of a lot of facets of the health and human performance industries, and once you have this foundation, you might find that you've got a particular area of expertise that you can really pursue as a "niche." Both Wil and I have a "niche," and we both have solid foundations - but we also realize that there are always other experts out there who can complement our offering and help deliver a better product to our athletes. Speaking of Wil, he just launched his Certified Weightlifting Performance Coach course this week. I'm 75% of the way through it thus far and it's excellent. If you're looking for a resource to help you in coaching the Olympic lifts, I'd definitely recommend it, especially at the introductory $100 off discount that's available through this weekend. Click here to learn more. This post comes a day later than usual, as we're playing a bit of catch-up after Sunday's 5th Annual Cressey Sports Performance Fall Seminar. Fortunately, there is some good content to make the wait worth it. Certified Weightlifting Performance Coach Course - I'm actually going through this new offering from Wil Fleming right now myself. Admittedly, I was skeptical of whether Olympic lifts could be taught via an online medium, but it's actually very well structured and I'm enjoying going through it. Wil discusses assessments and programming in great deal as well. It's definitely worth checking out if you're someone who's looking to learn more about the Olympic lifts and how to coach and program them. Applied Technology in Training and Rehab - This is an excellent guest post from Adam Loiacono on Mike Robertson's website. With the big boom of athlete monitoring over the past few years, it's important to understand how all the pieces fit together. The Ideal Business Show with Adam Bornstein - I loved Adam's interview for Pat Rigsby's podcast. Adam's a super bright guy who understands a lot about business development - particularly in the fitness industry, but definitely across multiple disciplines. Alignment precedes strength. All the rotator cuff work in the world won't make a big difference if it's performed it in the wrong positions. Another week, another Patriots win and fantasy football victory for me! I'll keep talking about it in this weekly blog until the luck wears off! They Myths of Mental Toughness Training: Part 1 and Part 2 - Doug Kechijian is a super bright physical therapist who also happens to have extensive military experience. So, you could say that this fantastic two-part article comes from excellent perspectives in multiple regards. Physical Preparation Podcast with Boo Schexnayder - This podcast from Mike Robertson is several months old, but I actually went back and listened to it a second time. There are loads of pearls of wisdom in there for any coach from any discipline. Podcast Q&A with Dr. Stuart McGill - There was some excellent information on the lower back front in this interview for Dean Somerset's site. The discussion of calcification in the spine of lifters of various proficiency is fascinating, and is around the 18-minute mark. 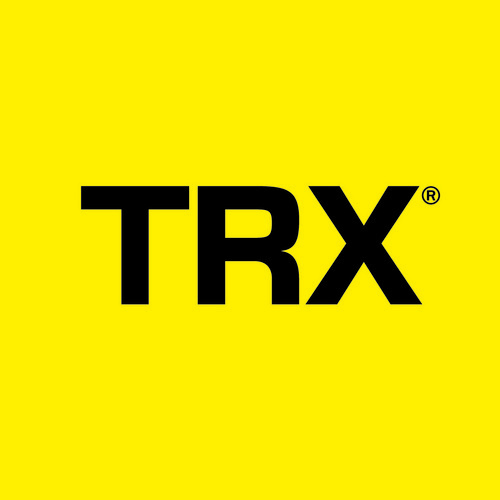 What do you think of <insert training device or method here>? The "training device or method" seems to come in waves. In training, for a while, it was kettlebells. Then it was Crossfit. In the rehab world, platelet-rich plasma (PRP) injections are a hotter topic these days, and I'd expect stem cell therapy for musculoskeletal issues to be the next wave. In the baseball world, people then asked about J-Bands. Then it was long toss. Now, it always seems to be weighted balls. Most of the time, people are asking the wrong question. Using the weighted balls example, I love them and have used them in various capacities since 2007. I've used them with teenage athletes and I've used them with a Cy Young Award winner. I've used them with 1st round draft picks and 50th round draft picks. You know what else? There were a lot of pitching coaches using them before I even started. And, they were well established in the track and field throwing community long before the baseball world adopted them. And, we now have plenty of studies in scholarly journals supporting their use. However, that doesn't mean they're right for every single application. If you throw weighted balls a week after you have shoulder surgery - and then blow out the shoulder again - is the problem the weighted balls? Or, is the problem that you were an idiot in your application of this device/method? If your 8-year-old does an aggressive weighted ball program and winds up with a growth plate fracture, is it the fault of the weighted balls or the program? Or, are you just a misdirected father who put the carriage way in front of the horse? The weighted balls are the device/method. The programming volume, implement load, throwing technique, time of year, and athlete preparedness are some of the variables that constitute the broader "application" category. My High Performance Handbook has been really popular across a number of training populations, but it's a horrible fit for you if you had spine surgery last week. A lot of people have great fitness success with Crossfit programs, but many wind up banged up because their application of these principles is wrong. They may not adhere to solid technique, or they may have pre-existing structural pathologies and movement impairments that should lead to contraindicating certain exercises. Front squats can be an awesome exercise. They aren't going to feel so good if you have a degenerative hip or acromioclavicular joint injury, though. J-Bands are a huge training asset to your arm care routine when used correctly. If you're going to use them incorrectly, though, you're better off leaving them in your equipment bag. Stop contraindicating methods and devices, and instead start improving your ability to critically think and evaluate applications. The best coaches that I know aren't just the guys with the most tools in their toolbox; they're the carpenters that know which tool is the best fit for the job at hand. 3 Laws to Master Coaching Young Athletes - Cressey Sports Performance coach Nancy Newell does an awesome job with our CSP Foundations (7-12 year-old) class, and this blog shows why. The kids have a blast and learn a ton in large part due to her enthusiasm and fun approach to coaching. Performance Metrics in Professional Baseball Players Before and Surgical Treatment for Neurogenic Thoracic Outlet Syndrome - In light of the rise in TOS surgeries in professional baseball, I thought it'd be good to link to this recent publication from Dr. Robert Thompson's group in St. Louis. It's important to note that the case studies in question were performed between 2001 and 2014, and they've actually improved the surgery and rehab in the two years since then. I'd venture a guess that outcomes are even better now. 3 Tips for Transitioning Your Training Model to Semi-Private - When folks come to observe at one of the CSP facilities, invariably, they wind up asking the question, "How can I do this with my clientele?" In this blog, Pete Dupuis provides a thorough answer. Elite Training Mentorship - Just a friendly reminder that the CSP staff uploads content to this resource every month, and the September update includes an awesome webinar, "Coaching, Cueing, and Performance," from Miguel Aragoncillo. If you're not willing to be proactive, plan on being reactive eventually. Better to do 5min of self care per day than 5 months of rehab. A while back, I published a blog called Making the Case for Training in the Post-Surgery Period. In short, it discussed how we are almost always dealing with athletes who are training during their rehabilitation periods. In many cases, this is strictly working around the issues while they're going through physical therapy. In writing these programs, one recognizes that it's actually far easier to write a program for a post-op lower body issue than it is for a post-op upper body scenario. Very simply, because most strength and conditioning exercise selections work "from the ground up," there are many more ways that lower extremity exercises can impact upper body drills than vice versa. Today, I'll outline some examples. There is grip involvement in deadlifts, various dumbbell single-leg exercises, and even squatting exercises that require an athlete to grasp the bar. Particularly in the case of elbow issues, too much grip work can become a real problem. 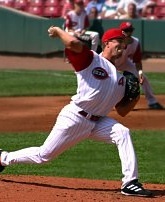 For example, in the 4-8 month period after Tommy John surgery, it's not uncommon for athletes to experience discomfort in the common flexor tendon region - and it usually has to do with the cumulative stress of gripping during strength training and rehab work on top of the intensification of the throwing program. Some doctors have surgical approaches that are a bit "rougher" on the flexor tendon, too. In these scenarios, you're best off working predominately with lower body drills that don't involve a lot of grip work. 2. Front rack position with acromioclavicular (AC) joint issues. With respect to "C," the front squat set-up is an absolute no-no. The pressure on the bar across the shoulder girdle can really take an upset AC joint and make it markedly worse. And, since this is in many cases an injury that we’re just “waiting out,” simply training through it will only makes things worse long-term. Therefore, deadlift variations, single-leg variations, and back squats (assuming no other related problems) are likely better bets. That said, we generally use the safety squat bar and giant cambered bar exclusively with those who present with AC joint problems. 3. Back squat position with internal impingement. Internal impingement (also known as posterosuperior impingement) is a broad diagnosis most common in overhead throwing athletes. In the late cocking phase of throwing (or swimming, tennis, etc.) - which involves external rotation and abduction - the humeral head tends to translate superiorly (up) and anteriorly (forward) relative to the scapula. These issues are magnified by poor scapular control, weakness of the rotator cuff, insufficient thoracic mobility, loss of tissue extensibility around the shoulder girdle, and in some cases, structural changes. The end result is that the biceps tendon, labrum, rotator cuff, glenohumeral ligaments, or nerves that pass the anterior aspect of the shoulder get irritated. The term "internal impingement" really just explains the pain-provoking position, not the specific diagnosis. Generally speaking, the pain is purely mechanical in nature; it won’t bother an athlete unless the “apprehension” position (full external rotation at 90+ degrees of abduction) is created. Just about every overhead athlete is constantly "flirting" with internal impingement problems, so my feeling is that it's best to just avoid this "at-risk" position in the weight room - and that's why we don't back squat any of our overhead throwing athletes. And, we certainly wouldn't use a back squat with anyone with symptomatic internal impingement. 4. Giant cambered bar with scapular anterior tilt, humeral anterior glide, and forward head posture. The giant cambered bar is an awesome option for avoiding the "at-risk" abducted, externally rotated position that often gives overhead athletes problems, but it can create a problem with athletes who are prone to scapular anterior tilt, humeral anterior glide, and/or forward head posture. Because of the positioning of the hands, the elbows are driven a bit behind the body, which can cause the shoulder blade to dump forward and "ball" to glide forward on the socket. You may also see the head shoot forward. That said, these faults can be easily minimized with good cueing. However, I wouldn't recommend using this bar with an athlete who has a big predisposition toward any of the three issues. 5. Scapular depression from holding heavy weights in the hands. The deadlift can be an awesome exercise for improving poor posture - but not in all cases. Specifically, whenever we have an athlete who sits in too much scapular depression and downward rotation (more info on that HERE), we'll avoid holding really heavy weights in the hands for lower body training. Our goal is to teach the shoulder blades to sit a little higher at rest, and functionally get higher when the arms need to go overhead. We don't want all our lower body work competing against that. During this time period, it's best to go with squatting variations, barbell supine bridges/hip thrusts, DB/KB goblet set-ups, sled work, the front squat grip, glute-ham raises, and anything else your imagination yields - as long as it doesn't tug the shoulder blades down. There are many more considerations for how lower body work impacts upper body function, but these are definitely the five I most frequently encounter that you should keep in mind. 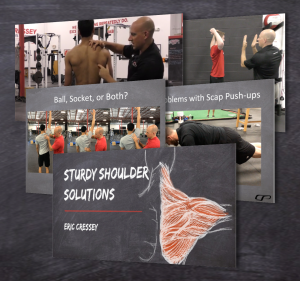 If you're interested in learning more, I'd encourage you to check out my newest resource, Sturdy Shoulder Solutions. Happy Labor Day! I hope you all are enjoying the long weekend with friends and family. This is always a fun time of year at Cressey Sports Performance, as a lot of our minor league players are starting their off-seasons, and many of our high school athletes are getting back in the swing of their "true" off-season training. And, of course, we've got MLB playoff baseball coming up soon! I won't digress too much, though; here are the goods! Will a High Protein Diet Harm Your Health? - Dr. John Berardi has been at the forefront of the "understanding protein needs vs. optimization" debate for a long time, and this article is a great summary of the current literature on the subject. 5 Concepts of Modern Manual Therapy - I know I have a lot of rehabilitation specialists who read EricCressey.com, and this excellent post from Erson Religioso is for you! Time to Break up with Your MRI Report - Physical therapist Andrew Millett authored this excellent post for Dr. Jarod Hall's website. We had a great staff in-service on strength and conditioning programming yesterday, and it really got the wheels turning in my brain. The end result was this video, which is especially timely, given that many professional baseball players are about to begin their off-season training.